This spring we are trying a few different things. 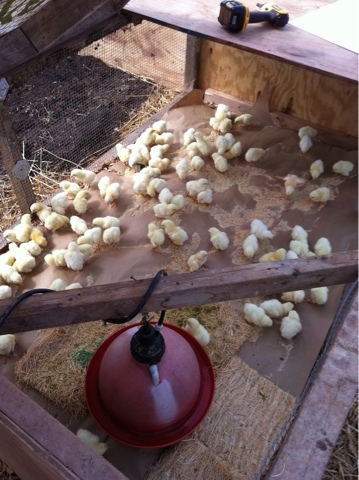 Our chickens are coming in batches from different sources and a couple of different breeds. We experimented a few years ago and selected one type of bird to grow out, now we will again to check out growth rate, flavor, etc. One thing in common this year: it has been warm both day and night. These temperatures are unusual for this time of year..and our brooders are inside the hoophouse..because we usually use the warmth of the sun to offset cost of keeping chicks warm. Several times a day we check on the birds. It can get way too hot for them so during the day we prop the big doors open for a cooling breeze. If it clouds up and rains the lights need to be on..if sunny and warm the lights can be off..eyes to the sky, constant temperature and sunlight monitoring. The goal is to get them out on the field, ready for the weather..who knows what that means!